During our boat tour focused on the architecture along the Chicago River a month ago, we passed several bascule bridges. This one carried two sets of rails, but is now…offline. Bascule bridges have a big counterweight, and on this one it sits/hangs above the tracks when the bridge is down. 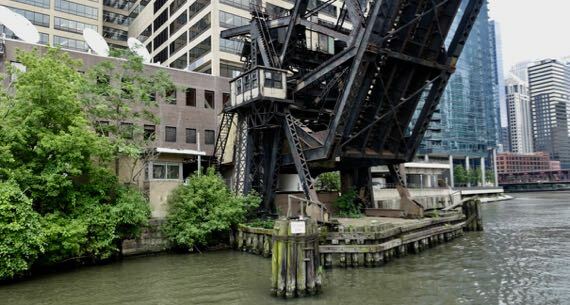 The first bridge across the Chicago River was a pedestrian bridge in approximately this location. This entry was posted on Saturday, 5 August 2017 at 7:47 pm.